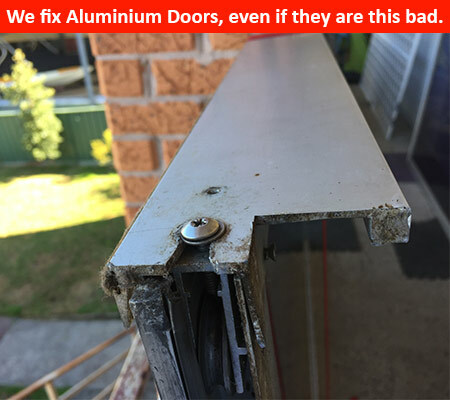 Looking for aluminium sliding door repairs in Sydney? Aluminium doors are by far the most common type of door the team at Adsafe Doors has been repairing for over 25 years. Over the last 40+ years, Aluminium doors have been the main type of door for builders in Sydney and all over Australia. Chances are you have either an aluminium patio sliding door, aluminium sliding door at the back of your house or an aluminium verandah sliding door. Nothing is worse than having a sliding door that is stuck, jammed or impossible to open. A lot of people ask us if they should repair or replace their aluminium sliding glass door and without a doubt, it is much cheaper to repair your door. The aluminium sliding door track is a critical component to having your door slide like new again. The bottom line is, your sliding door track has had the weight of the door rolling over it for more than a decade (in some cases even more). As a result, it is prone to wear and tear. It is not uncommon for us to see aluminium sliding door tracks that are completely pulled off the bottom part of the frame. The good news is, our process removes the existing damaged track. We machine your current track right back to a stump and then put a brand new stainless steel track over the top. Your new aluminium sliding door track won’t rust and will allow your door to slide like new again for many years to come. Click play on the video below to see our process for machining your sliding door track to ensure the best result for your home. There is a lot to be said with modern manufacturers about the aluminium door frame. We have noticed a continued decline in the thickness and durability of modern aluminium door frames. When you have an old style aluminium door like a Wunderlich or Airlite, we notice they are much more heavy duty. They are thicker and the aluminium is much harder. We are able to do all manner of aluminium door frame repairs on your door. We’ll do whatever is necessary to get it back to working at 100%. These are your main type of sliding doors and fill our calendar with repairs every week of the year in Sydney. The aluminium can often come in a few different colours, such as white, cream, grey or even black. That’s the beauty of aluminium glass sliding doors, as they are very versatile and can be coloured to suit your decor. Broken rollers are a huge issue. Like the sliding door tracks, they get brittle and are susceptible to constant wear and tear. Unfortunately, many sliding door rollers are cheap and low quality, which means you need to replace them frequently. Nothing is more frustrating than this. Over the 25+ years of repairing doors, we only use the highest quality Australian made double tandem rollers, which are built to last. They are able to hold heavy doors and distribute the weight evenly, so as not to put undue pressure on each roller. It goes without saying but the number 1 tip is to keep your track clean of debris. You don’t have to do anything serious. But every few weeks, just vacuum the track to keep the dirt and grime off the track and rollers. We are able to service your verandah sliding door anywhere in Sydney. We go from Parramatta to Northern Beaches. Bondi Beach to the Blue Mountains. The Hills district, Chatswood, Penrith, Seven Hills, Eastern Suburbs, Cronulla and anywhere in the Southerland Shire. Give the Adsafe Doors team a call today on 0417 464 743. Aluminium sliding door repairs are our speciality. We’d love to hear what issues you are having with your aluminium sliding door repairs so we can recommend the best solution at the right price.